We can still prevent a catastrophe of horrific magnitude from happening to US Jewry, but the choice lies squarely with the Jews. We are witnessing the end of US politics. The codes of conduct that have dominated diplomacy until November 8, 2016 have been tossed out as soon as the results of the election came in. Now we can see who are the real “basket of deplorables.” In today’s America, liberal zealots detest, denigrate, beat up, and as we have just seen, have declared an all-out war on anyone who does not agree with them. When a former Attorney General says that it is justified to kill other people for their political views, this qualifies as Nazism. And those who support her declaration are, by definition, Nazis, too. There is a very clear line leading from extreme self-absorption to any kind of extremism, including Nazism. Over the past several decades, the prevalence of narcissistic tendencies in people of all socio-economic levels has increased exponentially. There is a good reason why The New York Times raved about thee book The Narcissism Epidemic: Living in the Age of Entitlement, stating that “The evidence Twenge and Campbell [authors] have compiled is compelling and appalling.” It was an eye-opener for many of us. Looking after oneself is not narcissism. It is etched in our genes as a means to guarantee our survival. Yet, since the beginning of the Industrial Revolution, we have gradually shifted away from survival mode and into self-indulgence. Our growing ability to secure our income has led us to engage in all kinds of entertainment and exploration of ourselves and the world. The problem is that over time, we have become so preoccupied with our own feelings that young people today can barely see anything beyond their own needs. In the political arena, liberals, like the rest of us, have also grown increasingly narcissistic. The liberal mindset arose as a backlash against the fascism that took over much of Europe and eventually led to the outbreak of World War II. Its initial intention was good: to guarantee the freedom of thought of each person and prevent discrimination. But today, the noble ideas of pluralism have been distorted into a mindset of “My view is the only legitimate view, and if you think otherwise then you are a backward, fascist, bigoted, and a menace to society. Either be like me, or don’t be at all.” This extreme moralism is precisely the bedrock of Nazism. It turns out that today’s worst enemies of liberalism are precisely the people who claim to speak on its behalf. If a 73-year-old woman divorces her husband of 22 years just because he voted for Trump and feels that by his vote he “betrayed” her, clearly, this cannot be defined as liberalism, and certainly not pluralism. This is despotism. In the midst of all this perplexity, Jews play a very prominent role. On both sides of the political aisle, they are conspicuous, dominant, and active. When all hell breaks loose, they will become the first victims. Jews are great connectors. We schmooze, mingle, and create connections that pave our way to the top, where we cater to the interests of our cohorts. When things go wrong, it will make perfect sense to blame us for it. This is not a fictitious scenario; it has happened countless times in history, and there is no reason why it should not happen in America, as the rise in anti-Semitism already indicates. But it is not too late to prevent a catastrophe on the magnitude of the Holocaust or the Spanish Inquisition from happening in the US, and the choice to avert disaster lies squarely with the Jews. We Jews are great connectors for a reason. This aptitude is our single most important quality, the root of our people hood, and precisely the quality that we must introduce into today’s fragmented and hateful world. Midrash Rabbah, Maimonides, Pirkei de Rabbi Eliezer, and numerous other sources tell us that our nation began as a collection of outcasts and pariahs who discovered in Abraham a teacher and a leader who taught them that the hatred they encountered in their original tribes should be covered with love. He taught them how to unite above their animosities and alienation, and “trained” them in strengthening their bonds. The egos and the mutual hatred of our ancestors grew just as our egos are growing today. But instead of alienating themselves from society and dispersing, the Hebrews treated their growing egos in the same way a bodybuilder lifts incrementally heavier weights in order to strengthen his muscles. In this way, the ancient Hebrews became the ultimate “society-builders, ”fastening bonds so tight between them that they were able to commit to being “as one man with one heart.” At the moment they made this commitment, they also became the first, and only nation in history to have been built solely on the basis of love of others, rather than on geographical proximity or biological affinity. In this, to this day, the Jewish nation is unique. When we first became a nation, we were immediately tasked with being “a light unto nations.” Throughout the ages, Jews have pondered the meaning of this task. Today, I think it is plainly clear that being “a light unto nations” means introducing this unique method of connection that unites people where all other methods fail. The only pitfall in this design is that we ourselves have completely forgotten the meaning and purpose of connection. As I noted above, we can connect only when and where it suits our interests. But when we must connect in order to strengthen society, the whole of society, forget it. We are using the quality that we had developed for the purpose of offering it as a remedy for the world’s ills, to benefit ourselves at the expense of everyone else. People feel this in their guts even if they can’t articulate it. They feel that we Jews owe them something, that we are somehow to blame for all the wars. In other words, with their anti-Semitism, they are admitting that we can prevent the wars but we are not doing so. This puts the choice to do so squarely in our hands. We need not teach the world the method that we ourselves have long forgotten. We must simply reach out and connect with our own brethren. I know how hard it is for people of opposing political views to reach out to one another and even try to connect. I know the mutual loathing that exists. But I also know that this challenge is our gym. The hatred we feel is the weight we have to toil to lift in order to strengthen our “muscles” of connection. Rav Kook wrote that “The great rule about the war of views, when each view comes to contradict another, is that we need not contradict it, but rather build above it, and thereby ascend” (Letters of the Raiah).Likewise, the book Likutey Etzot (Assorted Counsels) writes, “The essence of peace is to connect two opposites. Hence, do not be alarmed if you see a person whose view is the complete opposite of yours and you think that you will never be able to make peace with him.” All we have to do in order to achieve peace is follow the wisest of all men, King Solomon, who said, “Hate stirs strife, and love covers all crimes” (Prov 10:12). But modern reformers will not be able to emulate that system unless we set the example for them. 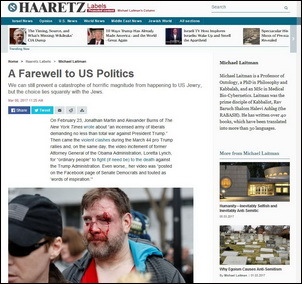 The Jews, who are so prominent on both sides of the political map in America, are in a unique position to change the course of American politics, American society, and the entire world. All we need in order to achieve this is to dare to take one small step toward each other. And the rest of the world can help us do just that. If the world understands the true task of the Jews and urges (or, God forbid, compels) us to do this, then we will unite for sure. Precisely because we Jews have within us an innate sense that we are indebted to the world, we are also more attentive to criticism from the nations than any other nation. If the world tells the Jews: “Unite!” We will oblige. We have got to understand that anti-Semitism is the world’s way of telling us to unite. It will not come in more pleasant or explicit ways, but rather more aggressive ones. Now that all other modes of closeness are collapsing and societies are disintegrating, only a method that lifts us over our hatred and unites us all above it can succeed. This method is our Jewish heritage and our duty is to bequeath this method onto humanity.